What’s wrong with this picture? Princess Leia, the warrior, is true, but is that all there is? I’ve been a huge Star Wars fan from the beginning. Princess Leia was important to me in 1977 and she is important now, but for different reasons. Thirty years ago, she was our ONLY girl hero, our only Princess, our only cinematic look at the fantasy fiction female, a girl with a gun on a very important mission to save her world. She was tough and knew what she wanted. She had a look that other girls emulated- she even started the double side bun thing. She wasn’t fluffy, but she was still pretty. She could fly and program the ship’s computers. She was a Jedi Knight. Enough said. 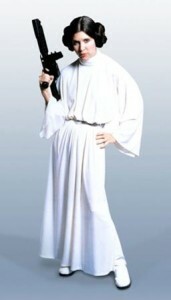 Now that the newest feature film is set for release by Disney, longtime fans of Leia have come out to be heard. They want more Leia for their daughters and grand daughters, the girls of this generation. Disney has responded positively, but there is still one more thing. Is it enough to just make action figures of this character? Shouldn’t she have her own show? Don’t we want to know more about this woman in the 21st century? After all, girls are rising and are poised to lead the free world.